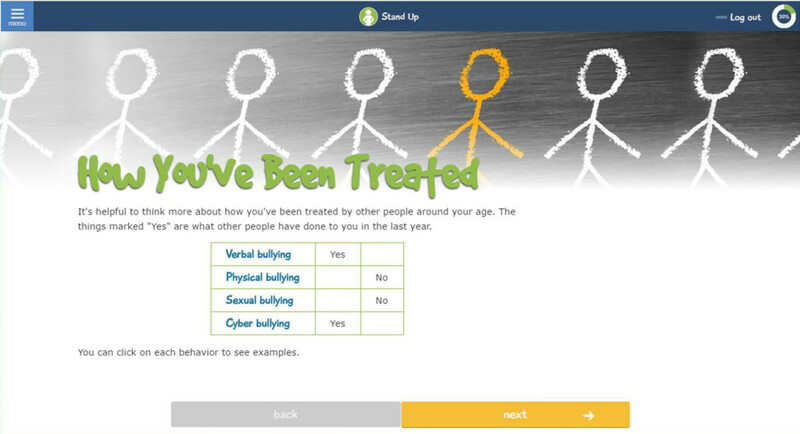 Stand Up: A Program to Prevent Bullying, adapted from the evidence-based Teen Choices program, focuses exclusively on the prevention of bullying in peer relationships. The 3-session program encourages using healthy relationship skills, and taking a stand to stop bullying when students observe it. In a feasibility trial involving 88 students, participants’ use of healthy relationship skills increased significantly from session 1 to session 3. In addition, compared to session 1, participants at session 3 had reduced odds of perpetrating and experiencing emotional and physical bullying, and of passively standing by as others were bullied; most outcomes approached or reached statistical significance (Timmons-Mitchell, Levesque, Harris, Flannery, & Falcone, 2016).